The first thing I learned about negotiating between rival gangs is that the old rules don't work. The only way to stop those wars was to change the process, and create a community.Inventive Negotiation demonstrates exactly how it's done, no matter who or what is in conflict. Reading these stories can change the way you work with others. It might even change the world. Empowerment to use inventive negotiations – we demonstrate how this works in a variety of personal and commercial settings. The reader will come away with a clear understanding of how powerful inventive negotiations can be. The heart of the book is a list of inventive techniques that can be applied in almost all negotiation situations. We provide details about when and how to apply them. We will also provide the reader with the tools to recognize the limitations of their negotiation partners’ thinking and the means to convince them to adopt inventive negotiations. That is, we show how to transform transaction-oriented competitive or integrative bargainers into inventive negotiators that focus on long-term commercial relationships. Negotiating Over a Limited Resource: What Would You Do? 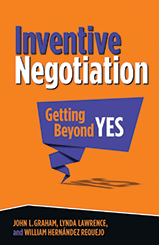 All of us who negotiate – and that really is all of us – would benefit from reading Inventive Negotiation. In clear prose and with wonderful examples, the authors explain the theory and practice of negotiation and how to foster long-term relationships. Every page is filled with insights that can benefit everyone, including even the most experienced negotiators. A unique use of new findings on facial expressions and emotion in improving negotiations processes. 2014 - Copyright @ 2019. Inventive Negotiation. All Rights Reserved.